Phone calls are accepted between the hours of 8:00 A.M. through 12:30P.M. and 1:30 P.M. through 5:00 P.M. Welcome to the Website for the North Canyon Consolidated Court. This Court serves all of Mohave County North of the Colorado River. Precinct boundaries begin at the state line near Mesquite, Nevada and continue to the state line near St. George, Utah (along Interstate 15.) Further, boundaries begin at the state line in Colorado City, Arizona and continue to the border of Coconino County, near Fredonia, Arizona. The North Canyon Consolidated Court is nestled amongst the magnificent red mountains of Northern Arizona. The nearest airport is in St. George, Utah, 52 miles (84km). Please DO NOT use the internet for directions to the Court. We have not found a web site that offers proper directions. If you are in need of assistance beyond the above instructions, please contact the Court prior to traveling. 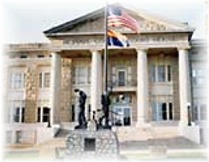 Our Court consists of the North Canyon Justice Court and the Colorado City Municipal Court. The Court is located in the small community of Colorado City, Arizona. North Canyon Calendar is posted each day at 3:00pm. Please click here to view current calendar.